ORDER YOUR CUT OF HAPPY BEEF NOW! We’ve bought a Hereford, well, all the edible parts at least and it’s time for you to order your cuts! We recently visited Reaseheath for a behind the scenes tour! 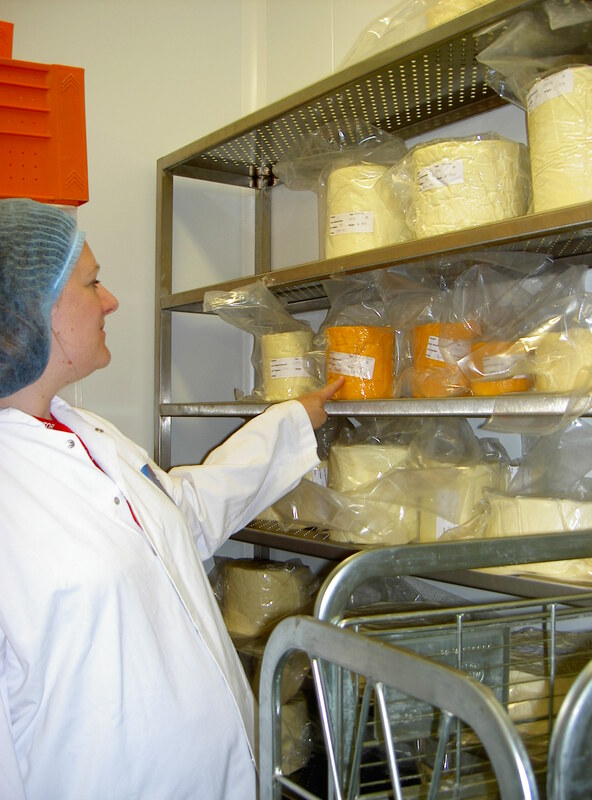 Laura and Elliott showed us round the Training and Testing facilities where our delicious cheeses, cream and ice-cream are all made. We also saw the bakery, butchery and excitingly named Innovation Rooms used for experimenting and cake decoration. In the main food room, the milk (collected from their own dairy herd in three huge storage tanks) is tested then pasteurised at 72 degrees for 15 seconds. The cream is separated for butter, cheese and ice cream making. Reaseheath has around 250 cows which produce 8,000 litres of milk a day! The butter is churned and packed using their unusual sausage shaped machine which gives it the lovely, artisanal finished shape. To make the cheese, homogeonised milk is cooled in large steel ‘baths’, rennet and a starter culture is added then after 6-8hrs it is checked for acidity, salt is added then it is slowly turned by hand to release the Whey. This looked like great fun and keeps the students hands really smooth! It is then pressed overnight to remove more liquid before being left to mature for anything up to 2 years! Although their Farm Shop was shut when we visited, Reaseheath is planning to build a larger Farm Shop and Café run by the Business Studies students that will be open all year round. We didn’t go away empty handed though as Laura and Elliott gave us some mini ice-cream tubs to eat on the way home! Thank you Laura and Elliott for a really great tour!